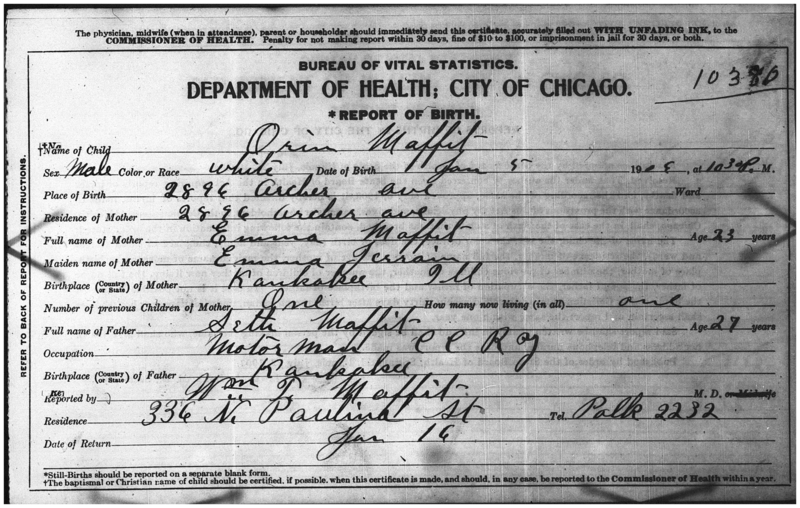 “Illinois, Cook County Birth Certificates, 1878-1922,” index, FamilySearch (https://familysearch.org/pal:/MM9.1.1/NQRD-DLP : accessed 07 May 2014), Orin Maffit, 05 Jan 1906; citing Chicago, Cook, Illinois, reference 10380, Cook County Courthouse, Chicago; FHL microfilm 1288111 (film accessed 06 May 2014 at BYU). I’ve been working on a bit of a puzzle this past year. Let’s start with the straightforward part. Orin Maffit was born 5 January 1906 in Chicago to Emma Jerrain and Seth Maffit. He was the second child born to Emma and the only child currently living at the time of his birth. Orin and his family were living at 2896 Archer Avenue. The informant of his birth was his uncle William T Maffit who was a doctor living about 3 1/2 miles away. “Illinois, Cook County Deaths, 1878-1922,” index, FamilySearch ( https://familysearch.org/pal:/MM9.1.1/N7WT-332 : accessed 07 May 2014), Orrin Seth Maffit, 23 Mar 1906; citing 2896 Archer Ave, Chicago, Cook, Illinois, Cemetery, cn, Cook County Courthouse, Chicago; FHL microfilm 1239737 (film accessed 06 May 2014 at BYU). 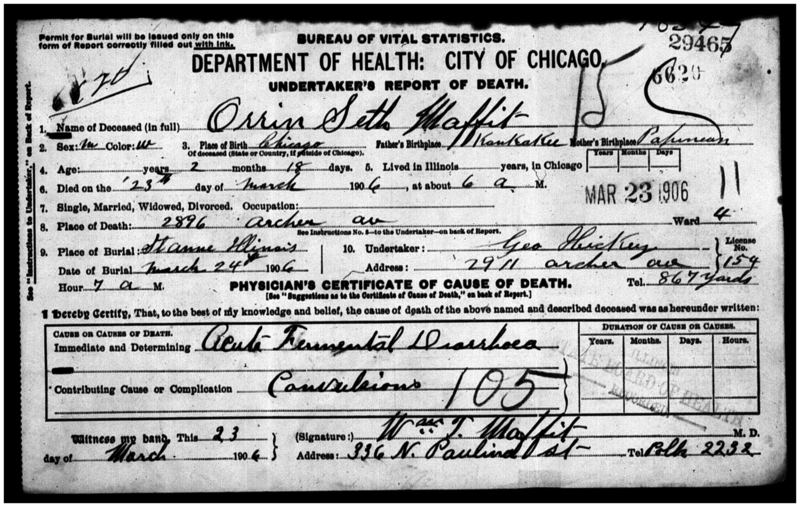 A short 2 months and 18 days later, Orrin Seth Maffit died 23 March 1906 in Chicago. He was buried the following day in St. Anne, Illinois. The Maffit family was still living at the same address. Once again the informant was Uncle William. The cause of death was acute fermental diarrhea with a contributing complication of convulsions. A sadly short life with very straightforward records. Except, no one in my family has ever heard of Orrin. Orrin is my great grand uncle, older brother to my great grandma Estelle the photographer. Orrin has several living nieces and nephews, none of whom know anything about his existence. Now you may be thinking to yourself that it’s pretty common for families to refrain from speaking about deceased children. True. But how about I muddy up the waters a bit? Never, not once, is Orrin listed. To complicate matters nicely, Chesterfield has two death dates listed on different sets of records. On top of that, I can find no records for a Chesterfield Jerrain Maffit. His birth date is identical to Orrin’s just one year earlier. One of his death dates is one year and two days earlier than Orrin’s death date. The 1910 census for the Maffit family lists Seth, Emma, Maynard, & Hilan. Emma is listed as a mother of 4 with 2 living. Orrin’s birth record lists his birth as the second birth for Emma. If there is both a Chesterfield and an Orrin, then both the census and Orrin’s birth record are inaccurate. So here is the question of the day – Are Orrin Seth Maffit and Chesterfield Jerrain Maffit actually the same person? Did they name him Orrin Seth and then at some point after his death decide to call him Chesterfield Jerrain? Do people do that? Or is there another child born to Seth and Emma that Emma did not include in her many family group sheets? What I know for sure is that a male child was born to Seth and Emma, they named him Orin Maffit and when he died 2 1/2 months later they listed his name as Orrin Seth Maffit. I know when and where he was born and died. I can prove that much. Now what do I do about Chesterfield? It seems I need to spend a little time paging through the Chicago birth and death records for 1905 to see if I can’t find something about Chesterfield. I also need to get to know the folks at the cemetery in St. Anne where Honor and Orrin are buried. If Chesterfield is in fact a separate person from Orrin maybe he is buried there as well. I think this puzzle may be one without a perfectly complete answer, but I am going to do my best to find every piece I can. For now, my tree has an Orrin Seth and a Chesterfield Jerrain. note: I only included the birth and death dates for the children who died before reaching adulthood to make the list more manageable for the reader. Puzzler! I have seen cases of children being given one name on their baptism and then a different one on their birth certificate, but it’s usually more like being given a middle name rather than a completely different name. Look forward to any updates on this one in the future! Yes this one seems pretty unique. I haven’t had a puzzle like this one before. Hopefully I find more info so there will be an update! On one side of my family, it’s a tradition to name the first daughter Theresa. So my aunt was named Theresa officially but we knew her as Betty (her parents didn’t agree on a name so this was their compromise). With that, I’d say it’s possible that the name could have changed but I agree with you that you should mine the fields for a Chesterfield! Good luck! I have considered this type of situation but I’m having a hard time getting from Orrin Seth to Chesterfield Jerrain. It just seems odd to me that they would change both names so drastically. But it’s definitely possible. Thank you!